SoS! Being a Great Boxer requires a healthy Sense of Self! According to Cappy Kotz, who founded Cappy’s Boxing Club in 1999 in the culturally diverse, Central District of Seattle, the popular sport of Amateur Boxing is good for a person’s health and well-being. Boxing both challenges and builds up one’s personal strength and confidence, and trains a person to face the “matches” in their life. So, how might this kind of activity directly connect to a person’s Sense of Self? Cappy’s Boxing Club caters to amateur boxing enthusiasts who seek to get fit in mind and body as they also strive to build community in the culturally diverse Central District. 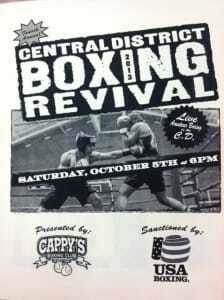 On Saturday Oct 5th 2013, I was in the mood to get out and do something I had never done before, and attended the Fourth Annual Central District Boxing Revival presented by Cappy’s Boxing Club. The Live Amateur Boxing Match event featured 10 sets of amateur boxers aged 8-34, who were members of various northwest boxing clubs. Sparring partners were evenly matched according to their weight class. The goal of each short “bout” was to see who could earn the most points for what counted as “scoring blows”. Amateur boxing (also called Olympic boxing) bouts are short in duration and fighters wear head protection (thank goodness), and in this type of competition judges award points for scoring blows (based on the number of clean punches landed) rather than physical power. Certain moves off limits such as “low blows” below the torso belt worn, holding tactics that prevent an opponent from swinging, and hard blows to the head. If, at the end of a bout, the judge finds that the boxers are equal in scoring blows, the selects a winner based on very specific criteria. First, who has done most of the leading off or was the effective aggressor? If equal, in that respect: then who has shown the better defense (blocking, parrying, ducking, side-stepping, etc.) by which the opponent’s attacks have been made to miss? If still equal, who boxed cleaner and had the better style? A Knockdown is not the point of the competition. And this is interesting to this novice as I will explain. I watched boxers blocking and ducking, and parrying back and forth and side-stepping their way about the ring—the goal to land a clean blow and earn points. What then is the difference between a boxer with a Healthy Sense of Self and one with a Lack of Sense of Self, I wondered. 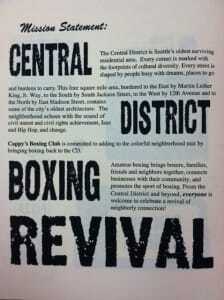 Cappy’s Boxing Club in the Central District brings boxers, families, friends, and neighbors together, connects businesses with their community, apnd promotes the sport of boxing. Beyond working your body to the point you are the master of it, as well as enhancing your strength, stamina and prowess in fighting, there is an element of mind training that requires and develops focus and discipline. Being an ethical “boxer” is a big part of this sport and there are plenty of criteria to stay mindful of. Boxers have strict rules of engagement when punching opponents and must not get carried away “in the heat of the moment” to win at all costs. If you are lacking a Sense of Self then you are dependent upon the outcome of your activity, according to the SoS Theory. In the case of boxing, as a person with a Lack of Sense of Self, you might be tempted to do what it takes to make sure that you defeat your opponent in the ring—which will get you either penalized or disqualified! On the other hand, if you have a Healthy Sense of Self, you know who you are and what you are worth; and that will show up in the quality of your boxing. Now, with a Healthy Sense of Self, your motivation to practice this sport is for the joy of using your body and mastering the rules of the game. Respecting the code of conduct and avoid potentially injuring an opponent is a given and there is no other (hidden) agenda . You’d also appreciate the challenge it affords you, to strengthen your body and develop self-discipline and focus and SELF-AWARENESS—to be applied to accomplishing other good things you choose. 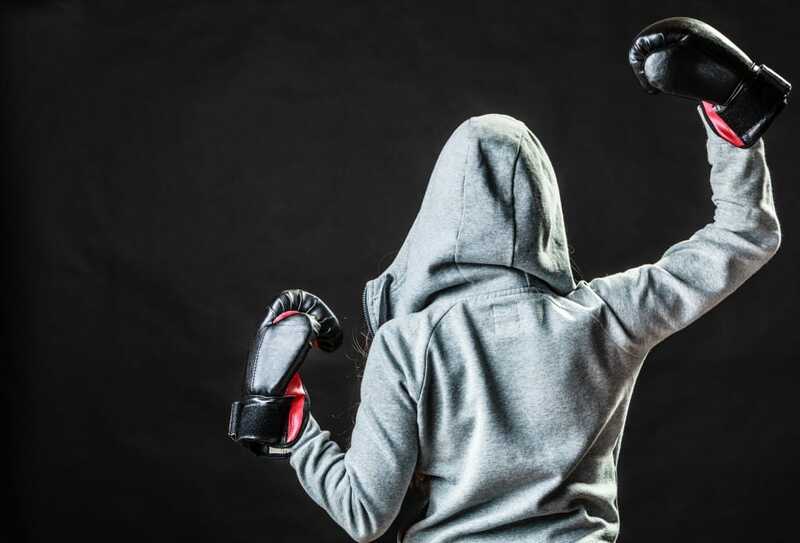 Amateur Boxing is an example of an activity that needs to be practiced from a place of Direct Motivation and it can have positive impact on your life. A friend of mine trained at Cappy’s for over a year after he experienced a personal crisis. His marriage had ended and he wanted to get fit in body and spirit through positive activities. And so he took up boxing for the first time in his life with the goal of regaining fitness and losing excess weight. With boxing he gained a restored sense of himself which made him confident enough to date again and, two years later, fit and strong and happy, he was remarrying to his delight. The Conclusion: Having a Healthy Sense of Self, or doing what it takes to restore your SoS by repairing in yourself what was missed out on or damaged during childhood, will make you a better sportsperson and what’s more, more prone to be victorious in sports as well as in life.